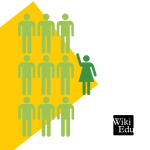 At Wiki Ed, our fundamental goal is to find gaps in knowledge on Wikipedia, and inspire student editors to fill those gaps with quality information. One of the biggest gaps on Wikipedia right now is the gender gap. Not only are 90% of Wikipedia editors men, but the encyclopedia also skews toward stronger coverage of men and men’s interests. There are more biographies of men than women compared to traditional encyclopedias. When there is coverage of women, it simply isn’t as good. Wiki Ed specifically targets courses and topic areas that fill content gaps. That’s why it makes sense for us to look at the gender gap as an enormous opportunity to close a major content gap. It’s a chance to deliver broader, higher-quality articles that otherwise wouldn’t organically appear on Wikipedia. Because 60% of all university graduates are women, we are already reaching out to where women are. Through targeting content gaps in fields where women are most concentrated, we’re reaching beyond that 60% level and bringing more content from those fields to Wikipedia. This fall, 68% of our editors were women, and more than 175 new or expanded articles concerned areas related to gender gaps in Wikipedia content. These courses made Wikipedia a stronger encyclopedia by providing content that would otherwise be absent. Articles about women that were created or improved by students include a great biography of Dr. Suzanne LaFlesche Picotte, the first female Native American physician in the US; an article on Minnie Evans, an African-American folk artist; and the article on Dorothea Erxleben, the first female medical doctor in Germany. These are just some among many, and we’ll be sharing more over the next few weeks. How did we reach 68%? We did it by identifying subject areas in higher education with large concentrations of women, or covering topics related to women. For example, our partnership with the American Sociology Association was crucial to tackling Wikipedia’s content gaps in sociology. With the success of that alliance, we’ve sought out additional support, such as the National Women’s Studies Association. Closing the gender gap isn’t just about bringing women to Wikipedia, it’s about filling the gaps in human knowledge that women bring to the table. We’re proud of our work — and the work of our partners, instructors, and student editors — in delivering that content to Wikipedia this term!